Medical marijuana is just one of many nature’s gifts. This is precisely why there has been so much pressure lately on the government to legalize the use of medical marijuana for treating serious diseases. Understanding the effects and benefits of marijuana is a lot easier when you have some fact straight, so we will try to give a short overview of the reasons why marijuana is actually great for treating certain medical conditions for both animals and humans and how it can be used in treating illnesses that affect not just humans but animals as well. Marijuana is often mistaken for a drug, mainly for its hallucinate properties, but it is just one side of this amazing gift of nature. Also, taking into consideration how bad sugar is for you, it can be said that sugar kills more people per year than marijuana, but let us explain how it actually affects the body of humans and animals. CBD tincture or hemp oil is of much use in medicine and it has many advantages. First of all, it allows the use of medical marijuana or cannabis in medical use and it seems to be the preferred way to consume medical marijuana. CBD oil is in fact extracted from cannabis, and it contains tetrahydrocannabinol or THC which is the substance that can help with many medical conditions. This substance is also produced by your own body, and human body in fact has two types of receptive cells for cannabinoid, which are known as CB1 and CB2 receptors. The cannabinoids attach themselves to these cells, and make it possible for its properties to be absorbed into the body. Commonly these two cells regulate some of the properties in your body that can make it easier for you or animals in general to deal with pain and illness. CB1 receptors are located all over the body and in the brain and are to do with movement, coordination, but also emotions, appetite, thought processes and most importantly pain. As for CB2 receptors they mostly deal with inflammation and pain, reducing the inflammation and pain in the body. For these properties of THC, it is often regarded as a natural and easy way to ease the pain, make some of the most painful diseases easier to handle and regulate appetite, mood and though processes. Just like with people, medical marijuana, or CBD tincture can be used with animals, of course with the consultation with the veterinarian and in the right dosage. That being said, the conditions for which this CBD tincture should be used are basically the same as with humans, cancers, painful conditions and illnesses that can be made easier with the use of natural THC. The dogs who are suffering from really painful conditions could find some peace and relief with the use of CBD tincture or hemp oil, and it could help them with the most difficult conditions without using chemically made sedatives or pain killers. If you are interested in alternative methods of treating your pets, then you should definitely read this article and if possible even fill out the surveys on this topic. Today we will be talking about a specific survey that was done by a veterinarian in California, and you will have the unique possibility to read more about the survey from the veterinarian who has done it. You might have already heard about the benefits of medical marijuana, and whether or not you are interested in this topic it is definitely controversial to say the least. People who are supporting medical marijuana often emphasize the fact that marijuana is a plant, with its own medical properties. Aside from the fact that it can also have some hallucinatory properties, this plant is beneficial for many patients suffering from the most serious diseases, such as AIDS, cancer and multipla sclerosis. That being said, if it has beneficial properties for treating these grave diseases, then it can also be assumed that it would be beneficial in treating animals from diseases as well. As a practicing veterinarian in the state of California, I have personally encountered dozens of clients that are already “experimenting” with the effects of medical marijuana on their pets. Many have reported that the MM did indeed result in medicinal benefits similar to those seen in human patients. I became especially interested in the use of MM to help improve the quality of life of pets with terminal conditions such as cancer. (Many people are unaware of the very limited amount of medications Veterinarians have available for treatment). I have created a basic survey for my own clients and conducted extensive research at the dispensaries themselves (interviews with dispensary owners, medicine suppliers, patients etc…). I hope to eventually conduct actual clinical trials with a select group of patients (pets) in a controlled scientific study. I am posting this to request that you help me to achieve this goal by completing a short survey. The more completed surveys that I receive, the more legitimate my research will appear to those who control the funding for formal clinical trials. In other words, the more completed surveys I can reference in my research proposal, the more likely it will be that I can continue to conduct further research. The results of this MCQ survey will also help shape the design of the actual clinical studies in the future. Would you be willing to help me by posting a link to this survey on Facebook, Twitter, and other social networking sites? We need to reach as large an audience as possible for the survey to be considered valid and statistically reliable. It only takes a few minutes to fill out and can really make a huge difference for thousands of pets in pain! Cleaning your dog’s ears at home is easily done when you know how to do it. Even though some people think they could not do it themselves, it is really easily done. However, if you are not experienced with cleaning your dog’s ears, perhaps you could also visit your vet and let them do it. With these tips you will certainly be able to do it yourself, so read the tips that follow and you will easily clean your dog’s ears. Your dog might not find the whole experience of cleaning their ears very pleasant, so make sure that you have someone who will help you do it properly. One person should hold the dog in place, gently holding their snout and the other person should really gently as possible clean the dog’s ears using the following method. Take a piece of cotton and roll it into a ball. Soak it in water or a solution and gently clean the outer parts of the ear, lifting the ear up and taking away the debris that found its way to dog’s ear. With gentle movements you will be able to remove the most of debris, just make sure that you do not push the cotton ball too much into the dog’s ears and stick to the outer part of the ear. Once you have cleaned successfully the outside part of the ear, you can use the following solution to gently pour a few drops inside the ear canal, for better cleaning of the ear canal. Mix one part apple vinegar with one part water and gently pour it inside the ear canal of your dog’s ears. Make sure that the water used is lukewarm, so that the solution is at the right temperature, otherwise your dog might not be as excited for having their ears cleaned. You can also use an alternative solution for cleaning your dog’s ears, which you can also easily make yourself, using one part hydrogen peroxide and one part water. Again, make sure that the water which is used for making this solution, and the solution itself, is lukewarm and pleasant for your dog. Drip a couple of drops inside the ear canal for best effects. Once you have dropped a couple of drops of one of these two solutions inside the ear canal of the dog, then make sure that you gently massage the area of the ear so that the solution can enter the ear canal and clean it from the inside. Gently massaging the area should give the best results. If you are afraid of using a q-tip for cleaning dog’s ears, then perhaps you should not use it at all. However, once the solution has cleaned the ear sufficiently, you could also use a q-tip and remove the excess debris from the ear. Just make sure you do not go too far into the ear, and stick to the outer parts of the ear, removing the debris. The solution will take care of other debris which are too deep into the ear for you to reach it with a q-tip. Once you have completed the ear cleaning, make sure your dog gets enough praise and a treat for being such a good boy or girl and having their ears cleaned successfully! Over-the-counter medication use is somewhat different with pets than it is with dogs, that is why you should read how you can use Benadryl for treating your dogs and in this text you will find everything you need to know. Benadryl (Diphenhydramine is the name of the drug and often the “name” you will observe on the generic brands) is an effective and safe over-the-counter medication that can be used in pets to help alleviate a wide variety of ailments. Most often, however, Benadryl is used as a light sedative and to help reduce the severity of allergies in dogs and cats. Furthermore, it is inexpensive, widely available to the general public and, most importantly, has a large “safety margin” which means that cases of toxic overdosing are extremely unlikely. In short, it is safe and effective which are two of the most important considerations when formulating a treatment plan for your pet. Benadryl comes in at least 4 different formulations making administration of the medication to your pet less of a struggle than many other drugs. You can purchase pills, capsules, liquid suspensions, and thin film strips (oral quick dissolve strips). When should you consider giving your pet Benadryl? I advise my clients to try Benadryl when their pet is displaying evidence of mild to moderate allergies. Clinical signs that the owner may report include excessive itching/scratching, sneezing, and red/irritated eyes. Often times, if you look between your Dog’s toes, the skin will be red, moist and have a foul odor. Saliva staining is a common finding where excessive licking of paws turns light colored hair into a brown, rusty color. It’s important to note that Benadryl is used to treat the signs (i.e. consequences) of allergies and does NOT address or treat the actual cause of the allergy. A complete physical exam by a qualified veterinarian, and sometimes laboratory tests, are required to identify the actual cause of the problem. Sedation is a common side effect that owners may observe in their pets after they have administered a dose of Benadryl. Veterinarians often use this “side effect” to our advantage. I prescribe Benadryl quite often for pets that display mild to moderate levels of anxiety/fear. Separation anxiety and fear associated with riding in automobiles are two good examples. As far as dosing, I always recommend that clients start at the lower end of the dose range and work their way up as needed. This is often referred to as “titrating the medication to effect”. The dosage for dogs and cats is 1-2 mg per pound of body weight administered every 8-12 hours as needed. It should be administered orally, approximately one hour prior to a potentially stressful event (a car ride for example). 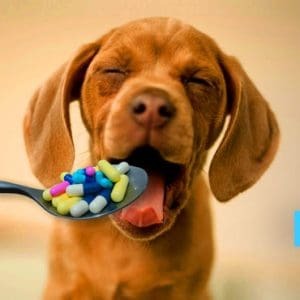 If you are treating allergies, then i would recommend using twice a day dosing for a full week to evaluate its efficacy (benefits for your pet). The most common form of Benadryl is probably the 25mg tablet. (So, just to give you rough guidelines, small dogs would receive 1/4 of a tablet 2-3 times a day. Medium dogs are started on a dose of at 1/2-3/4 of the 25mg tablet. And so on…). As is true of many medications, the animal’s individual body chemistry and genetics will determine its response to a particular drug. Some animals are very sensitive to the effects of Benadryl and the smallest amount will result in profound sedation. Other pets may require up to 4 times the starting dosage (this is still well within the safe dosing range) before any effects of the medication are observed at all. Never forget that every living creature is unique and much be approached as an individual patient rather than adopting a template or “cookie-cutter” approach to treatment. Cats Vs Dogs: Which Makes A Better Pet?